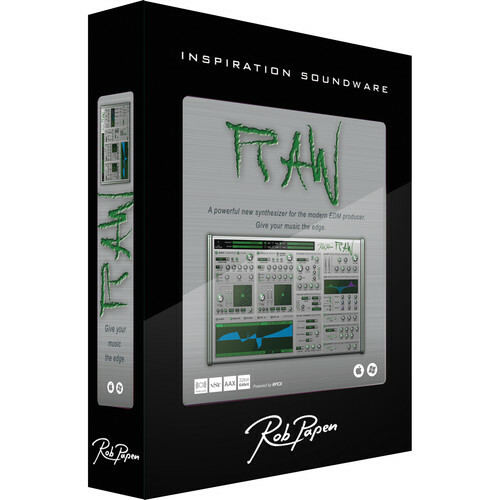 RAW from Rob Papen is a two oscillator virtual synthesizer featuring an X/Y field to distort the waveform using phase distortion. The instrument also allows you to draw your own waveforms and use them as LFOs, enabling the creation of unique 'wobble' movements that are perfect for dubstep and other styles of electronic music. RAW offers all of the Papen filters to further shape your sound. Additionally, the synth features EQ, waveshaper, distortion and lo-fi effects integrated into the synthesis voice level. Other effects include chorus, phaser, flanger, stereo delay and the HQ reverb. An arpeggiator and sequencer allow you to program your own patterns and rhythms. The Easypage and preset bank manager are also included as standard and feature presets from well known producers and DJs including Promo, Ophidian, Mad dog, Deathmachine, D-Passion, Rob Fabrie, DJ Thera, N-Vitral, Tha Playah, DJ Hidden, The Viper, Warface and many more.